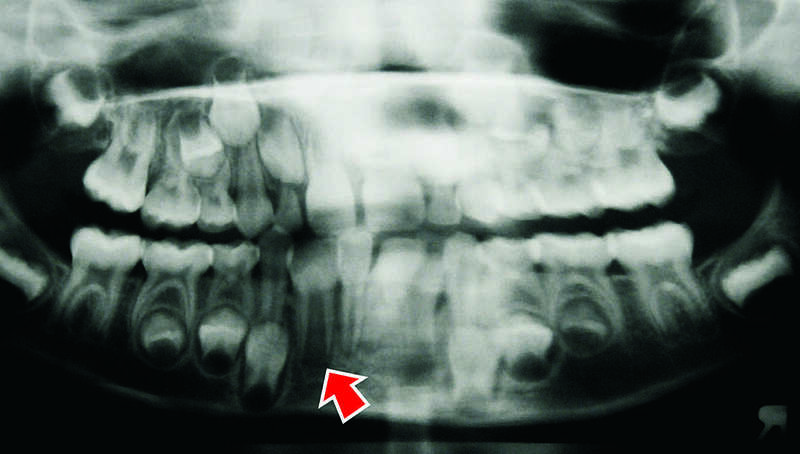 A rare genetic abnormality that can occur with tooth buds is Fusion and Gemination. Tooth Fusion is when two tooth buds fuse together to make one large wide crown. The fused tooth will have two independent pulp chambers and root canals. The fusion will start at the top of the crown and travel possibly to the apex of the root. When a dentist counts the teeth, they notice that there is a missing tooth. Fusion can also occur also with a supernumerary (extra) tooth resulting in a normal count of teeth. 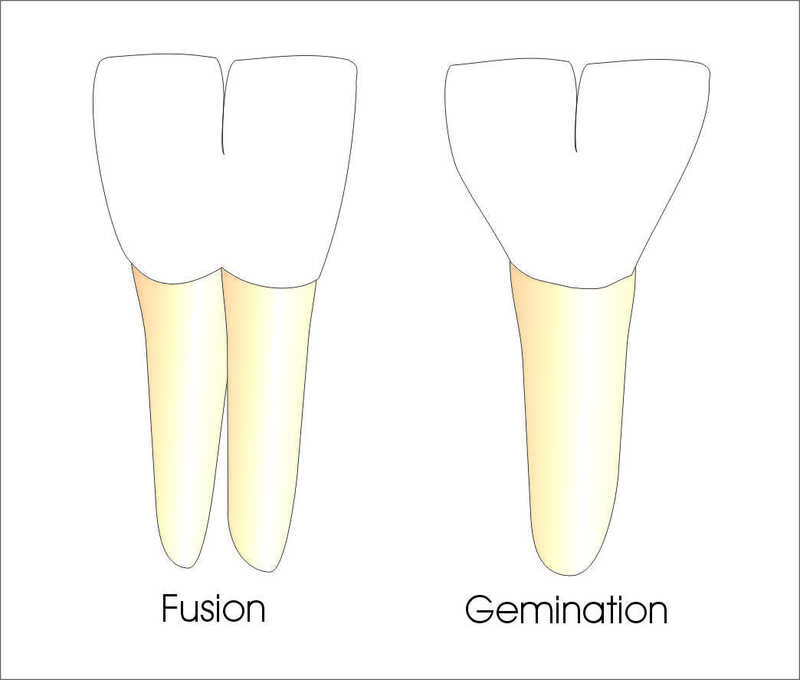 Tooth Gemination is when one tooth bud tries to divide into two teeth. The tooth count is normal with gemination. On the radiograph, the geminated tooth will have one pulp canal but two pulp chambers. 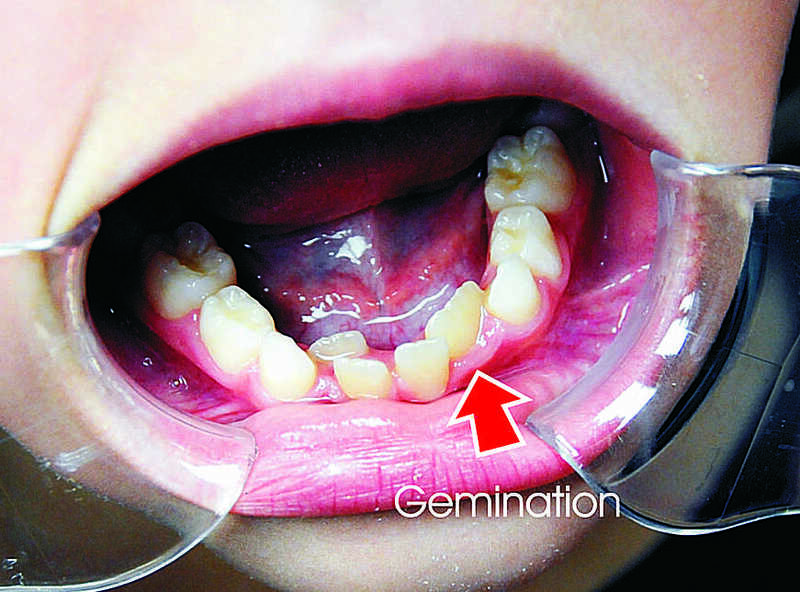 Fusion and Gemination can occur in the primary and permanent dentition but is seen more often with the primary teeth. It is commonly seen in the incisor area. If a patient has a fusion or gemination of a primary to0th, it does not mean that the patient’s permanent teeth will do the same. A parent could evaluate their child’s incisors and see if one of them is really wide compared to the others. This could indicate gemination or fusion. Ask your family dentist or orthodontist if you are concerned. What Can Be Done with a Fused or Geminated Tooth? If the fused or geminated tooth is a primary tooth, it may exfoliate by itself. If it doesn’t, the primary tooth needs extracted. Extraction of the fused or geminated permanent tooth is usually the normal course of orthodontic treatment. If the width of the fused or geminated tooth is not very wide, then the tooth could be kept. Also the area where the enamel comes together, the family dentist and parent needs to keep watch for cavity development. In rare cases, a geminated or fused tooth could have the crown resized to an exceptable width. It is possible that a root canal and a crown would be needed to complete the procedure. ← Previous Previous post: What is a Rapid Palatal Expander? Next → Next post: How Can an Ankylosed Primary Tooth Effect Jaw Growth?